I've been meaning to pick up sewing for years now About twice a year, I do some serious hunting and gathering in several fabric and bead districts. To be surrounded by all that fabric and all those notions just makes me want to pick up a needle, thread it, and...know what to do beyond that! 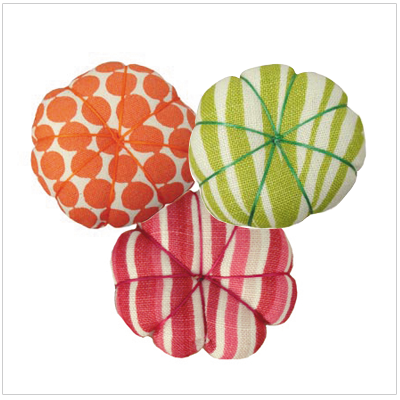 Anyway, if I ever do get around to it, these would be a must-have accessory for me: Hable Construction pincushions. At the very affordable price of $10, you can have a cute and stylish sewing accessory for your table.